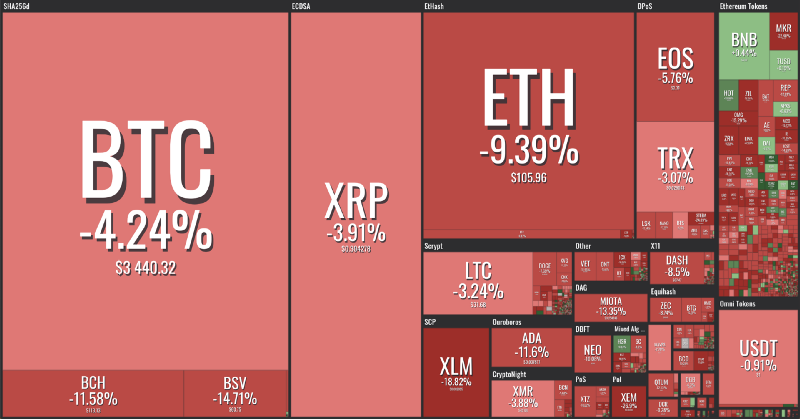 February 1: The crypto market has lost 6% of its value this week. While the markets fluctuate, Fidelity has announced plans to launch their custody service this March, easing the inflow of institutional money into crypto. Major exchanges are building additional services to attract new buyers. Fidelity Investments is targeting a March launch date for its Bitcoin custody service, according to three people with knowledge of the matter, as the mutual fund giant moves forward with a plan that could help ease fears around trading cryptocurrencies and help institutional investors ease into crypto. The WBTC project announced in October last year is now live on Ethereum. The project uses BitGo’s custody service and is thus centralized, like all other current fiat and crypto gateways, eg. payment gateways on WAVES. Until the crypto community invents new permissionless cross-chain capabilities, such services still provide a form of interoperability between different public blockchains. WBTC is minted as an ERC-20 token, and BTC custodial addresses are publicly known, meaning WBTC is a 1:1 backed token on Ethereum. This means that unlike Tether USDT, WBTC can actually be audited by anyone at any time. Currently more than 72 bitcoins in the form of ERC-20 tokens have been minted on Ethereum. This kind of service could be a possible substitute for other centralized settlement solutions, like Blockstream’s recently released inter-exchange settlement network Liquid, which is also a centralized scaling solution for Bitcoin. SWIFT has announced that they will integrate R3 Corda Settler, which launched in December of last year. They say the application aims to facilitate global cryptocurrency payments within enterprise blockchains and that the first “cryptocurrency” used will be XRP tokens. NEM (XEM) is a relatively unknown cryptocurrency in the West, as its community is more concentrated in Asia. Among the features of the network, the most distinctive is their Proof-of-Importance (PoI) algorithm, which differs from PoS in that it takes the number and size of transactions made by a block producer into account, instead of only the size of their stake. It also features asset issuance, but this is possible on many different public blockchains, including Bitcoin. On Jan 31, the NEM Foundation posted a message to the community explaining that “Crypto Winter” might lay the foundation for a financially unsustainable situation as early as next month due to unreasonable management by the previous governance council. The Foundation was established by the NEM community in order to promote the NEM blockchain and is now requesting the community to fund them with 160M XEM coins (~$7.5M) in order to continue operating and avoid planned layoffs across their 150 employees. According to Alex Tinsman, the newly elected president of the Foundation, expenditures during Dec 2017 and Jan 2019 were 80M XEM ($24.5M; average XEM price), most of which was spent on marketing. The XEM price has generally been very similar to the general crypto cycle movement of 2017/2018 and is still correcting from the new highs achieved during the cycle. After the community message, XEM decreased by 13% against bitcoin. NEM was one of the most dominant cryptocurrencies by network value (ranked the 6th largest) until just before the crypto crash in the second half of January 2018. The NEM Foundation’s irrational marketing spending is something very common in the crypto space: many projects focus extensively on achieving awareness and recognition via marketing efforts, airdrops, and being present at way too many conferences instead of directing the majority of their spending on developing the product. NEO and Tron are definitely the first two projects that come to mind as operating in a similar fashion, while XRP is probably the king of public opinion manipulation and creating an illusion of value through a constant stream of partnerships, conferences, and similar social sentiment defining factors directed toward an ignorant public looking for the next 1000x asset. What is common to all of these projects is that their organizations, founders, and team members hold a large percentage of the asset’s emission, meaning they have a direct incentive to inflate the price as well as their project runway. They tend to maximize the illusion of value instead of creating value. Binance announced this week that the exchange will allow traders to use Visa and MasterCard to buy crypto assets, effectively offering a fiat-to-crypto gateway. Bitstamp just introduced a completely revamped app for both iOS and Android. Coinbase, on the other hand, is experimenting with another aspect of the crypto space: education. Their new addition to the platform allows Coinbase users to earn different crypto assets while they learn about the crypto space, effectively introducing a new way for users to acquire their first crypto assets from an exchange — not by mining or buying it, but by earning it. Global network value reached $112.9B, with -5.8% weekly delta. Global crypto market turnover was $17.5B, 24.3% of ATH. Bitcoin dominance is 53.5%, with 1.9% weekly delta, and beta of 0.81. Ethereum dominance is 9.82% with -3.6% weekly delta, and beta of 1.30. Bitcoin hashrate is 44.8B TH/s, with -5.4% weekly delta. Ethereum hashrate is 146.01K GH/s, with -17.8% weekly delta. 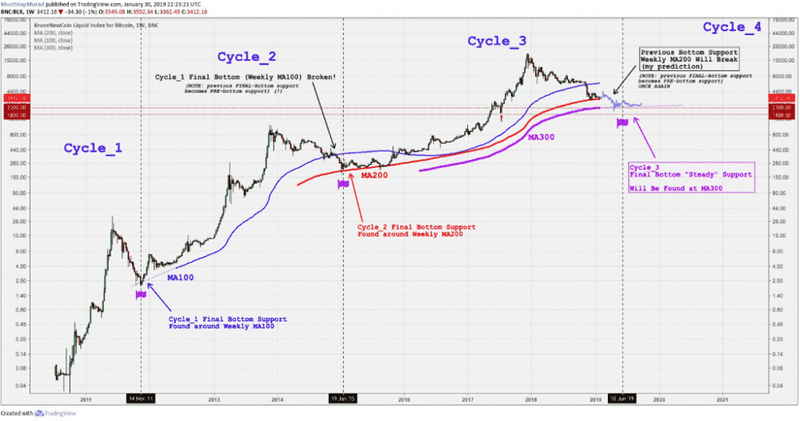 A theory about why the famous 200-Week Moving Average support from the last bear cycle will break during this bear market cycle, indicating a final bitcoin bottom in the low $2000s.